I stood up from my moderately comfortable seat at the gate to stand with the rest of the lemmings in the A line at the Cleveland airport on a Saturday morning. I had checked into my flight to Portland online when I got up at 5 am EDT. I found a seat near the front next to an older lady who made a point of putting her purse in the seat between us to keep it clear. She was getting off in Arizona. There seemed to be a lot of old people on my flight heading there. In Phoenix, I changed planes and got into another plane that already had my buddy Cheze sitting in it. He was coming up from Austin to tour the Pacific Northwest with me. 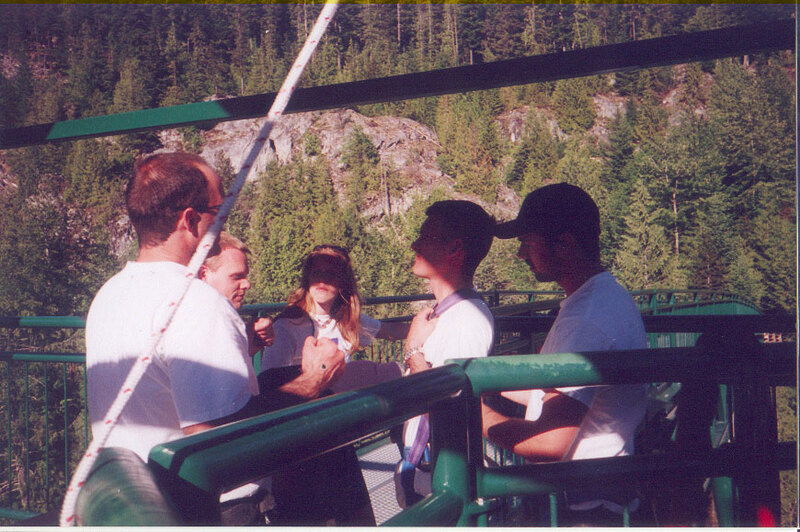 That afternoon, we arrived in Portland for a 3-day excursion to begin our 9-night trip. Our buddy Cougar picked us up in his pimped out 1970 Volkswagen Bus. 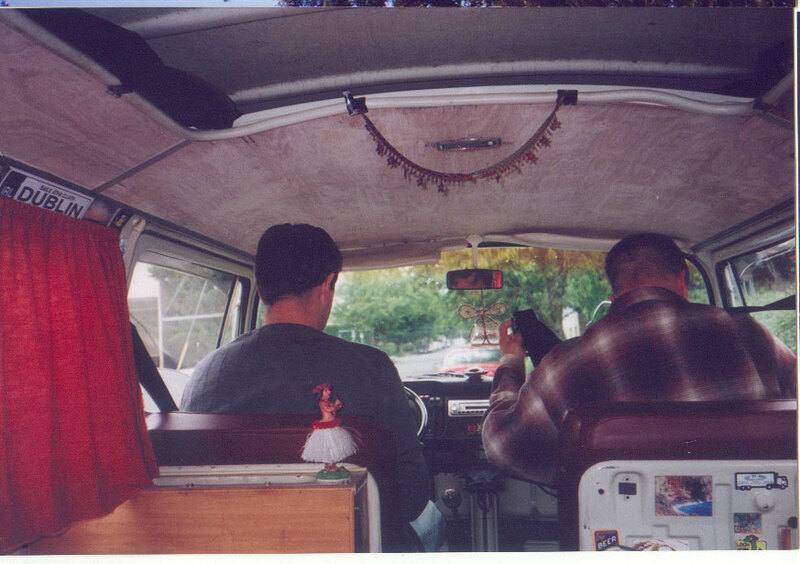 In addition to the groovy wood paneling and hardwood floors, it was tricked out with a pop-top roof and a plethora of bumper stickers. Portland has its share of vintage cars being used in daily life. Due to the mild weather, they all seem pretty much in good shape (albeit a bit washed-out-looking from the rain). The colorful cast of characters we’d see in our travels started in Portland in front of Scooter’s Ice Cream. There was a guy sitting in a vintage Dodge Caravan with “Stayin’ Alive” blaring from his stereo. As the ladies walked by, the guy made his monkey hand puppet dance with joy to the sounds of the Bee Gees. When the monkey got tired, the guy picked up his wigged skull head and bobbed it out of the open passenger window. Much like Austin, Texas, many folks living in Portland were not born there. However, there is a significant number of natives that grew up amongst the natural beauty. Some were perturbed with the influx of people from other parts of the country that were not as eco-friendly as the natives. I’d hazard a guess that the mean age is 30-something, possibly with young children. The people of all ages seemed relatively fit through the area, especially when compared to places like Texas. 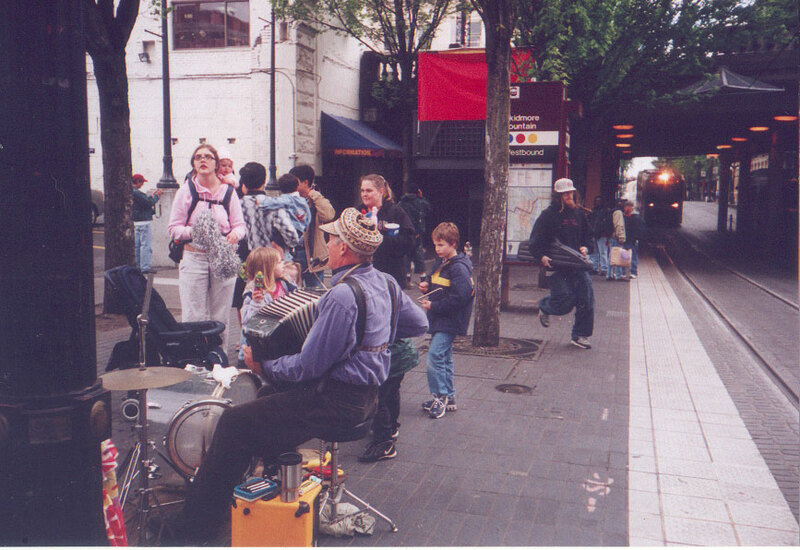 Our days in Portland were spent with music abound. We ate dinner at a Lebanese restaurant called Vine Leaves. Our buddy Thorm was playing guitar with a band that included an upright bass, piano, and a female vocalist that sang in French (or was it Lebanese?). In between sets was a belly dancer. The next day, we had 5 people playing acoustic guitars. Relatively new to me, I worked some notes from a leftie guitar whilst playing right-handed. I’m sure the experience has contributed a little something to my musical background. An evident pattern I began to notice in Portland was the harmonic minor. I remember building riffs from 1-4-5 patters on A harmonic minor. In addition, when we picked up the rental car, Cheze loaded it with some Secret Chiefs 3, an act out of Mr. Bungle land that rocks out the Arabic tunes. 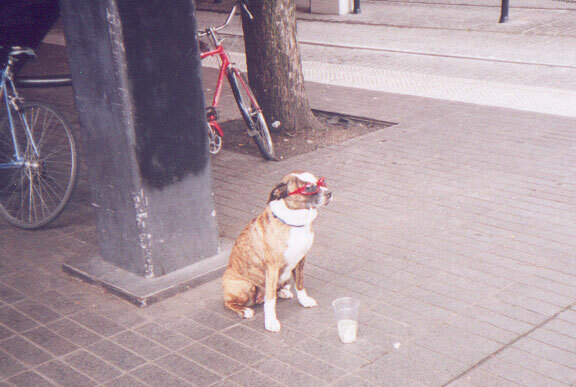 On Sunday morning (due to being 9-5 stiffs, we all get up relatively early on Sundays), we stopped by the Saturday Market to witness a dog wearing sunglasses and a cigarette. We then hit Music Millenium where I hooked up with some Zappa, Jimmy Smith, Chick Corea, Miles Davis, and the new Beck CD. We headed to see a recital of a vocalist receiving (and deserving) her bachelor’s degree in voice. A voice, she certainly had. Much as you must maintain a free flowing stream of air from your lungs through the reed into a saxophone, the vocalist treated her larynx like a horn and her vocal chords like a reed, producing rich overtones across a significant range. 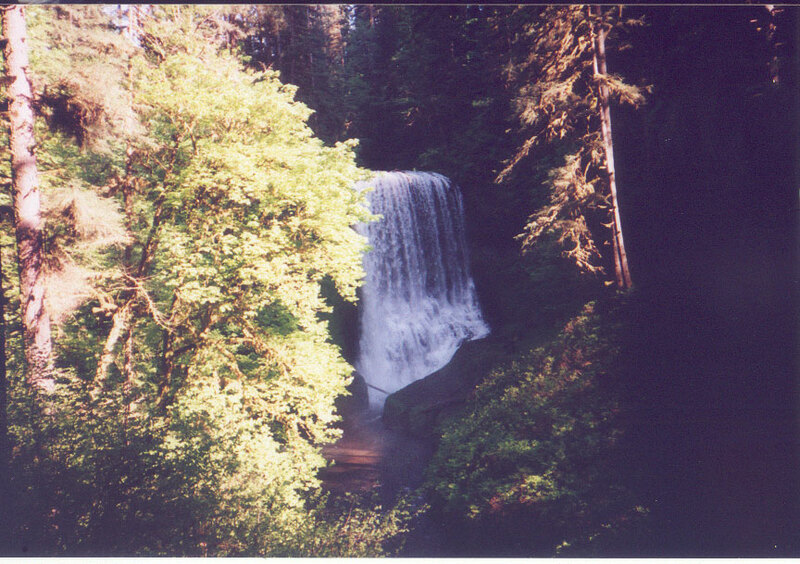 On Monday, Cheze and I took a day trip to Silver Falls. 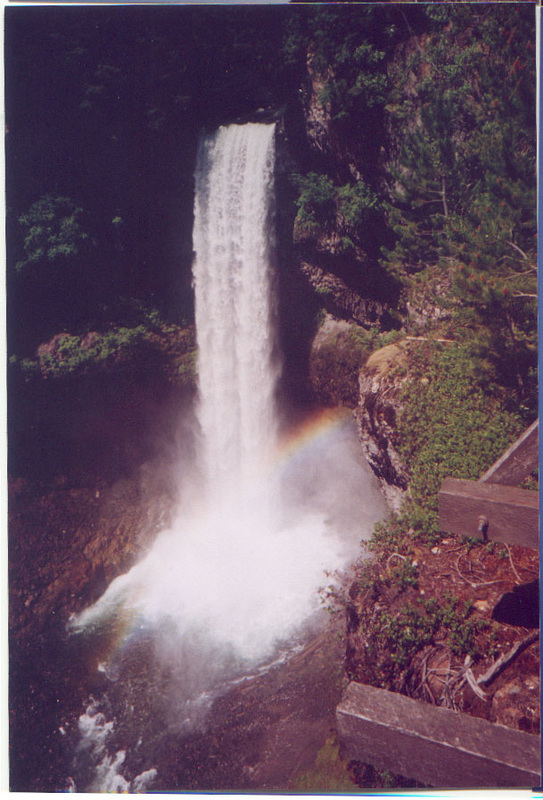 I’d highly recommend it as a compact place to see multiple waterfalls. Count on a 2-hour hike to catch most of them. 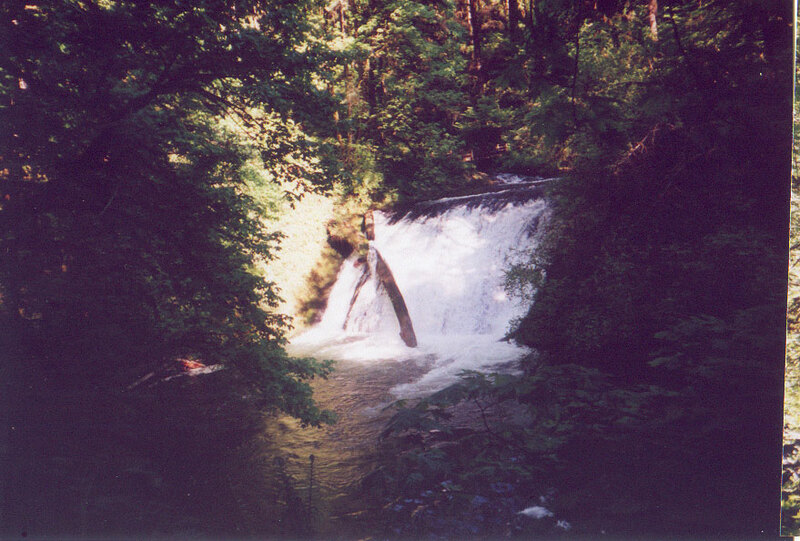 The jewel is the Twin Falls, located in the very back of the park. 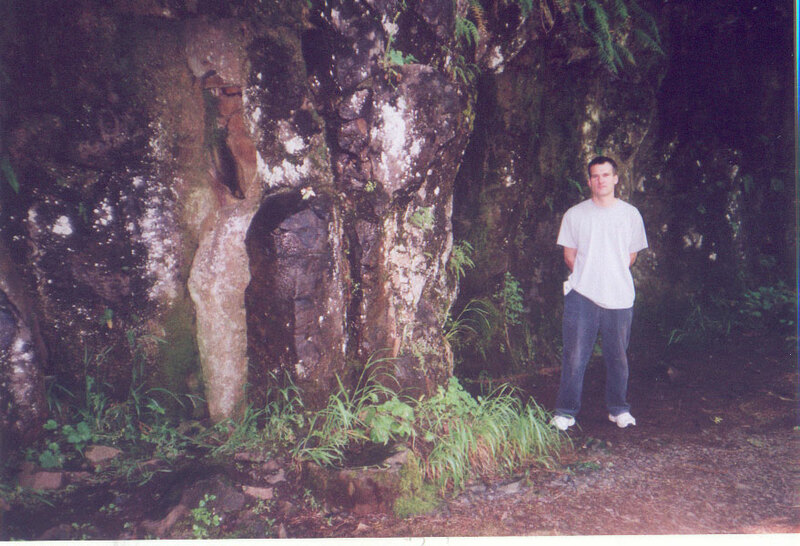 It reminded me of the Cascades in Fes, Morocoo, only it is bigger. On Tuesday morning, we awoke in Portland to drop our friend Cougar at Tazo Teas where he’s employed as a professional tea taster. Cheze and I were off to Vancouver, BC via I-5. We had to deposit a bud and pipe, lest we consider something like smuggling across the border. We utilized our Neverlost GPS in the rental to get us near the border and near the coast, just off of I-5. We found a dead end overlooking the sea and I made a deposit under a bush for later withdrawal. The car ride was riddled with Frank Zappa albums we had recently purchased at Music Millennium. We arrived in Vancouver in the late afternoon. It was just in time to check into our hostel. We scoped out a couple alternatives before deciding, but we ended up at the Cambie after seeing the off-the-wall nature of its surroundings. There was a large crowd of interesting-looking people within a few blocks. The other big hostel up the street looked too ritzy for our lowdown tastes. The two of us got into the 8-person dorm, hoping to meet some of those interesting people in Cambie. It wasn’t long before we headed up to the New Amsterdam Cafe. It was a nice little coffee shop. Contrary to beliefs held outside the area, pot is illegal in Vancouver. However, it seems to be tolerated at the coffee shops. You just can’t buy it there (or ask anyone about it or tell anyone where to find it). However, the herb isn’t very hard to find in Vancouver. A reliable place might be where large crowds gather. No place better than the hostel pub. Go pick out some tunes at the jukebox and observe. You might even solicit the help of some guy standing nearby who you think might sell ganga and have him pick you a song. It is also possible to score by going to another location in the vicinity of Hastings. I simply walked up some random set of steps into the second floor of a building where I entered a large room with various people standing around as well as a line of which I had suddenly become a part. The line faced a man wearing business attire sitting behind a desk. We all glanced at a nearby closed-circuit television view of the stairs that led to the second floor office. The man behind the desk pulled out a couple of big buds and put them on the scale in front of him. The guy in the front of the line prudently confirmed the transaction. Tourist prices are around $10 CDN a gram for any number of quality alternatives (though we were unable to find anything up to the level of what was waiting for us in Washington). Unlike Amsterdam, there are no menus so you might want to brush up. We’d seen multiple varieties sold at the same venue from different dealers at different times. As with pot almost ubiquitously around the word, you need to be in the right place at the right time. In Vancouver, the right time is more often than not. After running into the faux paus of asking the coffee shop if they sold brownies or the like, Cheze got a short lecture from the guy at the register. After which, he was righteous to point out that it is not so good to spread the word about these sort of things. Reinforcing that thought was an experience with one guy that sat next to us at the café and kept to himself. There was some question about his ability to clearly form words. It was as if he had stitches in his mouth. He started asking about where we got the herb and Cheze was getting paranoid. Perhaps this guy was a snitch that had his tongue cut out and was forced to lead a life trying to find other rats. Perhaps he wore a wire that was hooked up to the closed-circuit system we’d seen at the dealer. Perhaps this line of thinking can be induced by copious consumption of high grade. After all this, we decided to take a lap around the town. The charm we’d witnessed upon arrival to this corner of Vancouver stretched through Chinatown. It was like characters in a B movie. Between people talking to themselves and strange old women, this part of town was a trip. An unattractive hunchbacked crotchety middle-aged woman finished a conversation with two guys then shouted some unintelligible gibberish to a nearby tourist. After this bizarreness, she hermited herself behind closed doors until the next scene. Later that night, Cheze and I were looking for a pharmacy for ear plugs to filter possible roommate snoring. We asked direction from a classy-like old homeless woman who was standing on a porch. I thought she lived there, but it turned out we interrupted her squatting. She nicely gave us directions but warned in her listless, hollow voice of the sickos and needle addicts on the way. No doubt she spoke of experience. We were uncertain of what that experience entailed. This was all followed up by getting flashed by a sadly damaged and likely not entirely sane 19-year-old as her pimp stood nearby. We awoke Wednesday at our hostel and decided to head up to the New Amsterdam for a morning coffee. They were closed, so we sat in Victory Square across the street. Actually, it is more like a circle with a monument called the Cenotaph in the middle. A kid sitting in the grass by the Cenotaph finished rolling a moderate stick and moseyed on over for a light. Another guy across the square was hitting a hackey sack as his friend was breaking up some buds. It seemed there were many morning tokers a bit too early for the coffee shop. Cheze walked over to the hacky sack guy and the two of them went at it. Eventually, the other guy finished rolling his spliff and stepped in, followed by a third sacker out of nowhere carrying a matching fat spliff. Having only hackey sacked a small number of times with no guidance, I stepped in for the greatest lesson I’d ever gotten. It all started when the two spliffs were lit simultaneously and passed in opposite directions as the sackin’ began. The tips I got out of it were first and foremost to utilize the inside and outside of your foot. Lower body flexibility is very helpful. Hitting the sack using the top of your foot is a bit harder to control. In either case, ideally, you want to have the surface of your foot that contacts the sack parallel to the earth as you hit it. You can tell these guys had been practicing. One guy had a sack that contained a minimal amount of sand, allowing the sacker to do additional tricks, notably some nice stalls. Playing in a hack circle leads your head to constantly follow the hackey sack, like a tennis match. Watching those guys trick it out with stuff like the stalls and huge arcs led to some interesting spectator head motions. As the circle toked, some trash sweepers came by the monument and discussed cannabis smoking after noticing the green smell. The lady preferred a couple beers, but she actually had a basis to make the comparison. Moments later, this guy strolled up reading his police report. He had recently been caught with 3.127 grams of herb. He read the report aloud like an actor reading a script with added commentary. The previous night, Cheze and I sat in the same square as a paddywagon stopped on the corner. The cop driver got out and walked to the back of the paddywagon. He opened the back door and let a bloke out. Then, he got back into the driver’s seat and left the scene. I couldn’t help but wonder if there was a connection. As the spliffs burned out, the guy with the buds that rolled one suggested “roaching” the roaches. Avoiding the sweepers, the roaches were deposited in obvious spots in the immediate vicinity. The idea was so that some lucky roach picker would come along for a nice surprise. The guy wanted to reciprocate for all the times he’d been one. After getting our sack on, we walked to Stanley Park. Vancouver natives had told us a little about the local geography. Downtown Vancouver is a small area with lots of people. 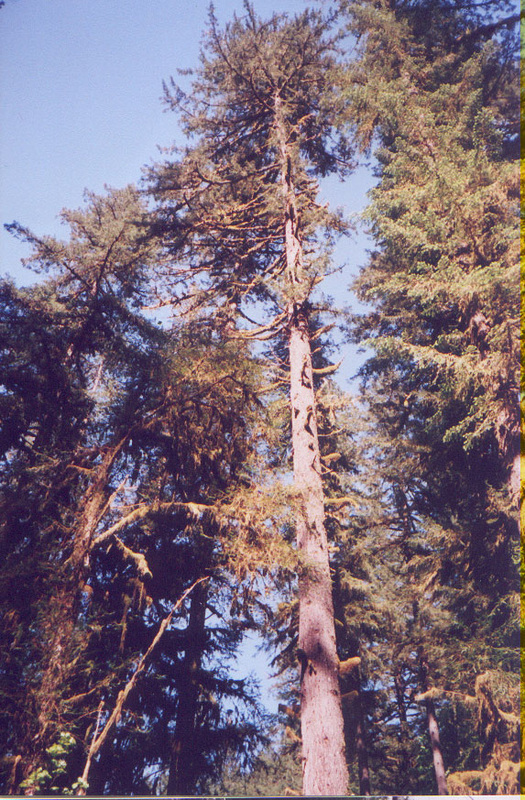 Connected to the city is a peninsula into the Burrard Inlet called Stanley Park. The park was left unspoiled after the Canadian Army abandoned its base which was there to protect Canada from an American invasion. They might want to rethink that decision, but for now, this huge park remains and is about the size of downtown. If someone tells you they are from Vancouver, they may likely be from any number of other nearby small cities. Across the inlet from Stanley Park is West Vancouver. There are also areas such as Burnaby and North Vancouver that are similar in size to Vancouver proper that make up the metropolitan area. Like most urban parks, Stanley Park is a nice respite from urban life. 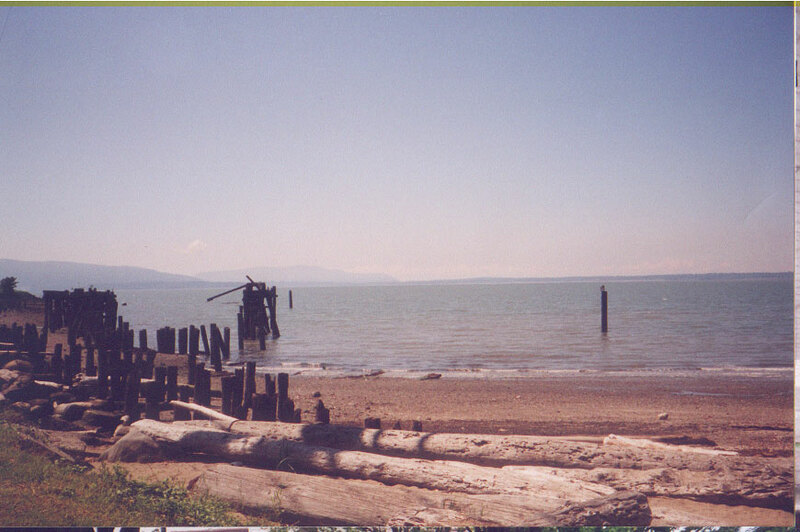 What separates Stanley Park from the others is its scenery. Since the park juts into an inlet, there is a seawall that surrounds it yielding great views of West and North Vancouver, as well as the bridge to Whistler. It was that evening when sleep deprivation that had been building through the trek took hold. I spent the evening into the morning in a top bunk next to the window listening to the sounds of Vancouver night. Shouting profanities in Canadian, aye? The next morning, we were off to Whistler for some skiing in late May. When we arrived, there was not a cloud in the sky and the temperature was in the high 20’s (80’s). Nevertheless, we were destined to ski. We rode the gondola to the Peak lift, and then we were skiing in t-shirts next to bikini-topped snowboarding women. Actually, I was falling next to them, but it was still a good time. There was a minimal number of runs (compared to the thought of the awesomeness it must be in the winter), but we couldn’t complain about the weather. It truly reminded me of the Caribbean, but with skiing. Some slopes were beyond my limited abilities, but I felt some degree of progress with guidance from Cheze. Once again, the lower-body is worked out. This arises from the need to keep your feet together as you alternate your center of balance between the skis, digging your inside edges into the mountain behind you. This results in your ability to rhythmically commit to zigzagging down the hill. The upper body’s only challenge is to remain pointing straight down the hill. The second day of skiing was even more intense. It was in the midst of multiple cloudless hot days in a row. It was a heat wave in the Pacific Southwest of Canada. I laid on a minimal amount of sunblock on my face, but didn’t cover the underside of my nose. It seems that sun reflected by the snow resulted in some nice blisters in an odd place. Be liberal with the sunblock. After skiing our second day in Whistler and spending our fourth day in Canada, some observations were made. We began to hear ourselves ask each other rhetorical questions formed by the word “aye.” “It’s a nice day out, aye?” Also, the Canadian accent became clear when we compared it to our native Pittsburgh accent. Out = “Owoot” in Canadian, but “Aht” in Pittsburghese. I could clearly hear thoughts in my head forming with a Canadian accent. It was clear that once we left Washington, we were in a different country. The clear denotation of the room with toilets is the washroom. There is little deviation. There is also the accent, the metric system, colorful money, and people from all over the world. Of the people I met in Vancouver, I was reminded of the limited time that is often spent in places by American tourists. We met a kid from England who’d been in Vancouver almost two weeks. If not found sleeping, he might have been watching the tube. It would be nice to be in a town long enough to just kill some time. 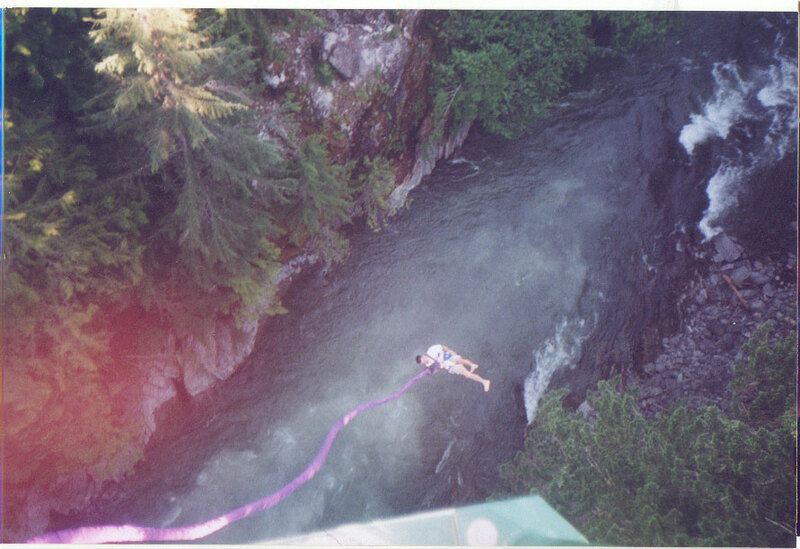 It was with that thought in mind that I called the Whistler bungee jumping company. Cheze and I were interested, having never done it, but didn’t want to spend hours watching other people jump and getting safety lessons and driving there and setup time and whatnot. I got through to the guy and he said, “Can you come now?” Perfect. 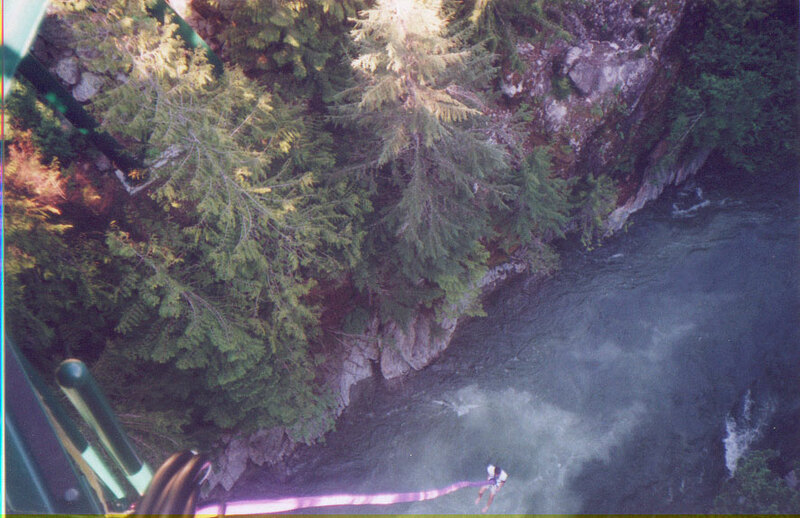 I did two 160-ft jumps off of a bridge over a creek. 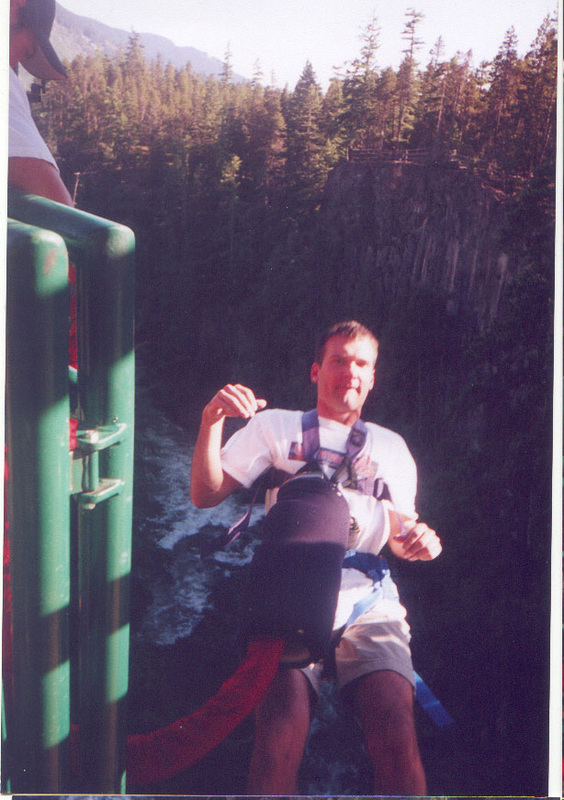 First, I went forward, as if I would normally jump off a bridge with ill intent. Cheze was concerned about this very thought as he’d been having nightmares about that sort of thing, so he went in reverse, stepping off facing the bridge. I had to try it that way, but I thought the first one was much more of a rush and therefore superior. On our last evening at Whistler, Cheze met some girls in the pool. He was especially interested in one young hot Russian named Inga. He needed a wingman, so we delayed going out in order to try to set it up. I spent a brief moment in the hot tub, but was clearly more interested in the outside scene. After a couple hours brewing in the tub with Inga and her roommate, Cheze finally made it back to the room and we headed out with the provision that Inga and roomie would be available until midnight. Cheze and I hit the spot. We stopped by a bar called the Amsterdam, having such luck with it in Vancouver. It was definitely the spot. No herbs of course, but the place was out of sight. The barmaid wore her hair in a huge Camarillo Brillo and had a section of her t-shirt cut out over her breasts so you could see them tucked inside her brassiere. They were totally swamped and I guess my eyes were too much on her eyes instead of her breasts so I could get a couple beers and she snapped, “Why are you looking at me like that?” The waitress kept pushing me out of her way as I stood at the bar because the place was packed. The bar was the only lane of traffic. As midnight approached, we headed back to our room to call up Inga and have a jam session. I had brought my melodica and Cheze checked an acoustic guitar for the trip. We got the chords for Hotel California from Inga’s roommate and Cheze and I jammed out some harmonic minors. At about 1:30, the ladies said goodnight, and we headed back out, this time to Buffalo Bill’s. At that point in the night, the meat market it was earlier turned into a sausage-fest with only a few chicks that were clearly accounted for. It was time to crash after another pair of exhausting days. The next morning, we had breakfast with Inga and her roommate. It turns out Inga has a boyfriend, but he was in Colorado at the time and hadn’t called her for days. It might have all worked out for Cheze if not for the roommate. We knew it when Inga said, “Come to Vancouver to visit. You can visit me and Tina would love to see you… or you can just visit me.” Chez is in like Flynn, if only he could make it back to Vancouver some day. With that, we were off. Peaches En Regalia and Dinah-Moe Humm accompanied. 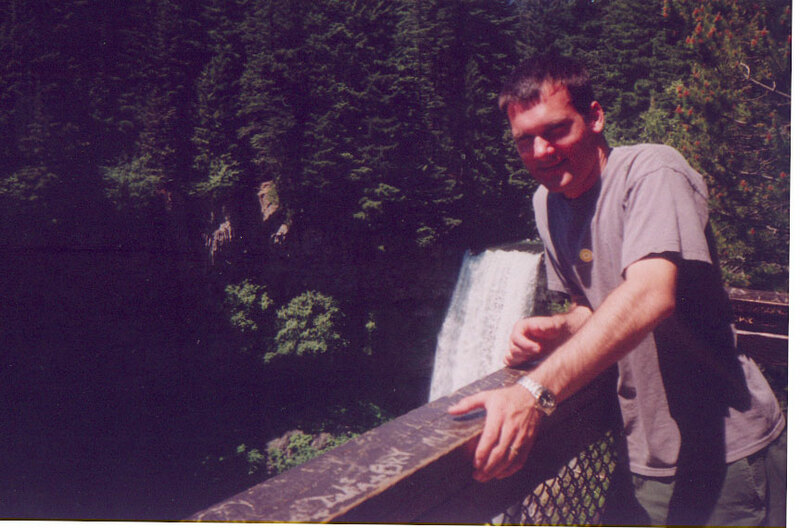 Before exiting Canada, we visited a couple of waterfalls that were literally on the way to Seattle. 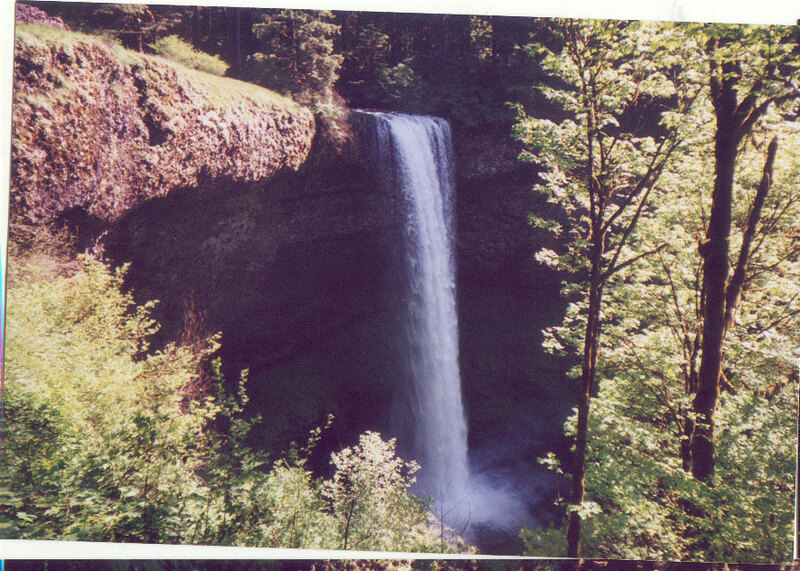 Brandywine Falls was especially impressive. It is about a 210-foot straight drop (Canada’s Niagara Falls is only at about 167 feet). 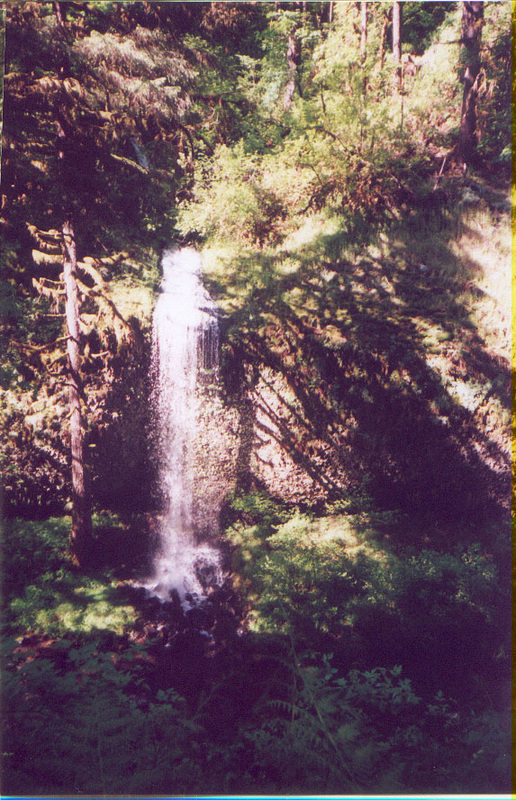 Though it is narrow, the water flow was pretty intense as the rushing creek above it tumbles over the edge of a lava formation. While walking to the viewing deck, you think to yourself what fun it might be to be whisked away in the creek that is running along the side of the path. 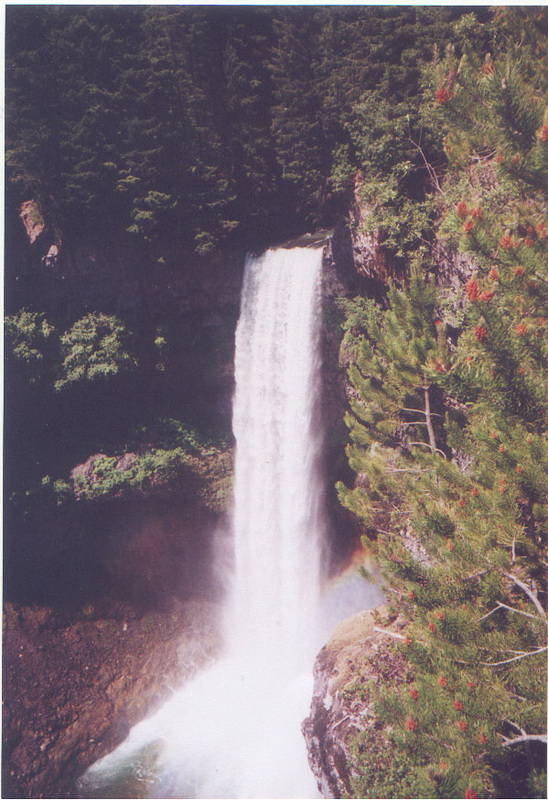 Then, you get to the falls and see why it isn’t such a good idea. 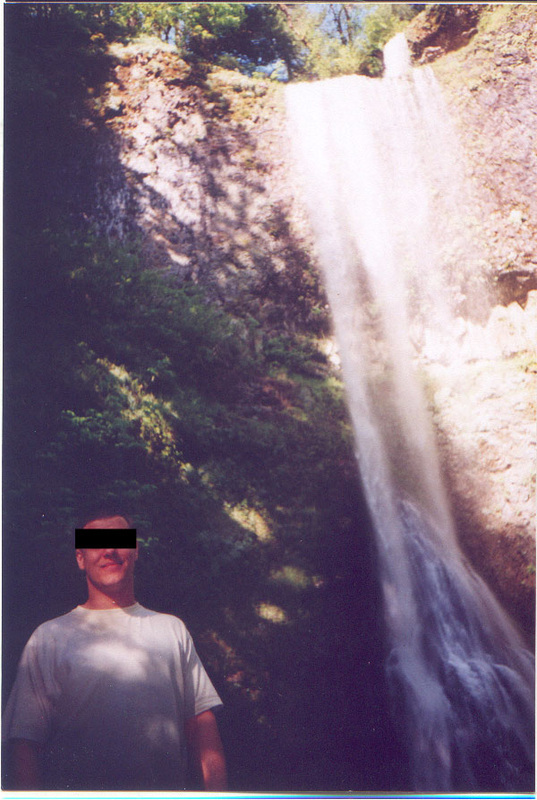 We were unable to get close enough to confirm, but the bottom of the falls didn’t look too deep. 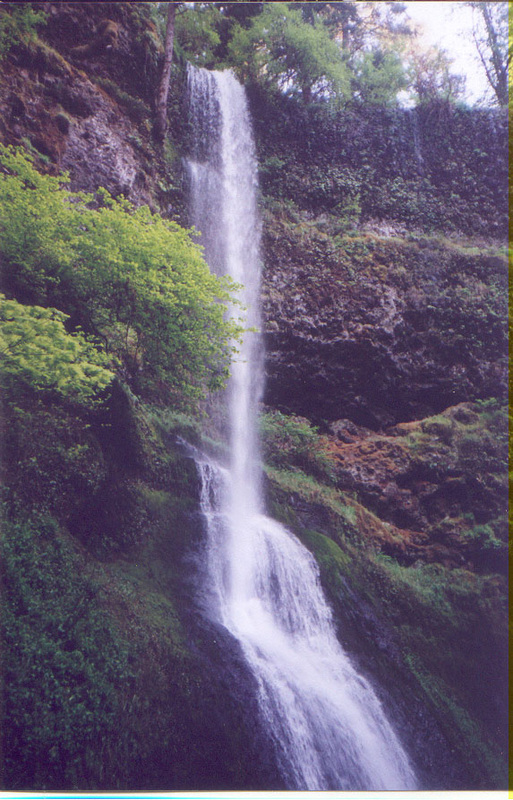 It was merely a continuation of the water flow from above. 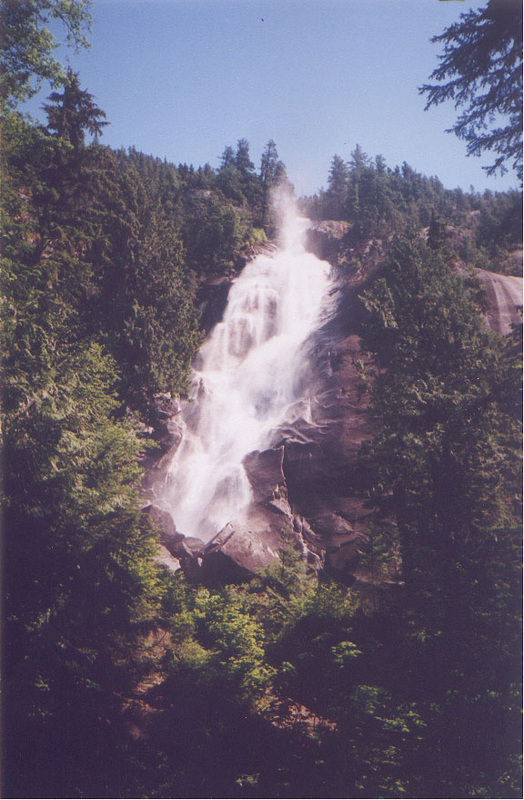 Shannon Falls was more impressive as we drove past than it seemed obscured by trees at its park. Once we crossed the border with much less difficulty than the first time when we were taken in for questioning (“Where you from? Why are you here? Where’s he from? Where in Canada are you going? Where you from? Where’s he from? ), we stopped by the sea to make a withdrawal. Interestingly enough, our stash of a pipe and a film canister of ganga was not only still intact where we stashed it, but some other person stashed their backpack right next to it! Amazing stash spot! It was clear from the green smell that permeated the rental when the sack was removed from the film canister that Couger’s little hookup included the best nuggets of the trip. We arrived in Seattle at around 6. It was hotel hell. The HI was booked, so they recommended the Moore. I called a couple places and they wanted a buck seventy five a night. It was outrageous. The Moore was less than half that. It had a shared bath (not that it mattered), but they were booked the next night, so we had to transfer to the Kings, which had free parking, private bath, and was about the same price as the Moore. Both are in walking distance of anything downtown. Saturday, May 28th was my 28th birthday. Cheze celebrated by hooking us up with tickets to dinner and Bill Frisell. There was a bit of a scheduling conflict with live music, food, and greens. Generally, greens are best consumed as dessert after a meal. This allows the full effect to be in force while relaxing and watching Bill Frisell’s jazz trio rock out. We managed to get some appetizers for dinner just as the trio stepped out to warm up a bit. We then hit it for a brief smoke. No smoking is allowed in the jazz club, so we ended up in the jazz alley, conveniently behind a dumpster. I think I scared the crap out of one guy as he rounded the dumpster. As he walked away, he just laughed. We returned to the show and watched the drummer get down with some fat, yet intricate beats. Bill had plenty written out for himself and the Hammond B-3 player. Frisell’s huge hands allow him to manhandle the guitar, utilizing his big thumb on the E and A strings. Overall, he is a very entertaining character, cracking dry jokes and mumbling about some topic. He even dropped his pick in the middle of a smoking solo, but recovered quickly as the organist was ready to slide in to help him out. The organist kept his right foot planted on the swell pedal while his left foot only occasionally hit the deepest bass notes for emphasis. The bottom manual of the organ was used by the left hand to play basslines for this trio that lacked a dedicated bass player. The right hand played rhythm on the lower manual or soloed on the top manual. After the show, we had some time before the end of the night, so we headed up to the touristy Pioneer Square to check out the scene. I walked down 2nd Avenue. On the right, the second shift and midnight workers were waiting for the bus. On the left was a pair of drunken kids pushing each other back and forth as they walked to the next bar. We walked past a girl selling hot dogs. She tried to entice me with her index finger as if I was into processed meat and I was hammered at that moment. As we approached Pioneer Square, we passed a guy carrying a sign that said “Smile.” He vociferously implored us without, of course, using the word. It was a nice thought. Later in the night, we saw another. Cheze thought it was monkey-see-monkey-do for some spare change, but I thought it was bright (though I spared no change). Perhaps it was a coordinated effort to light the gloomy city (though that day’s weather was awesome once again). 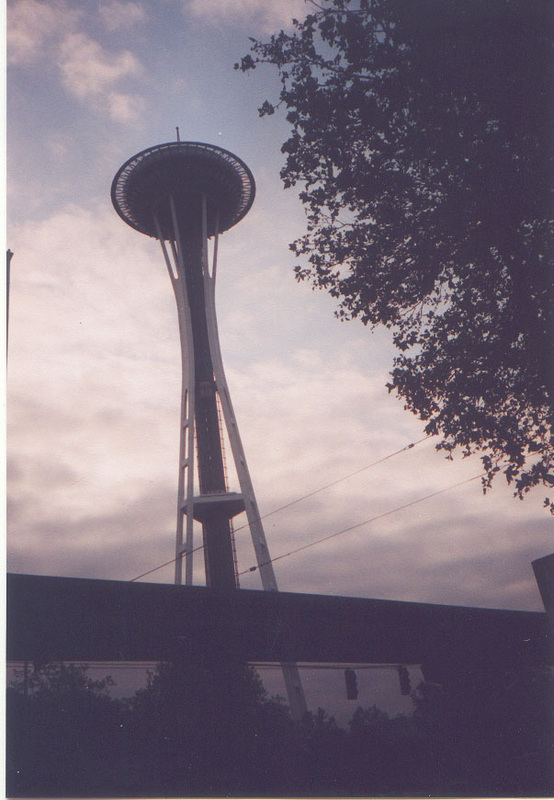 We spent our final day in Seattle doing the requisite tourist activities. 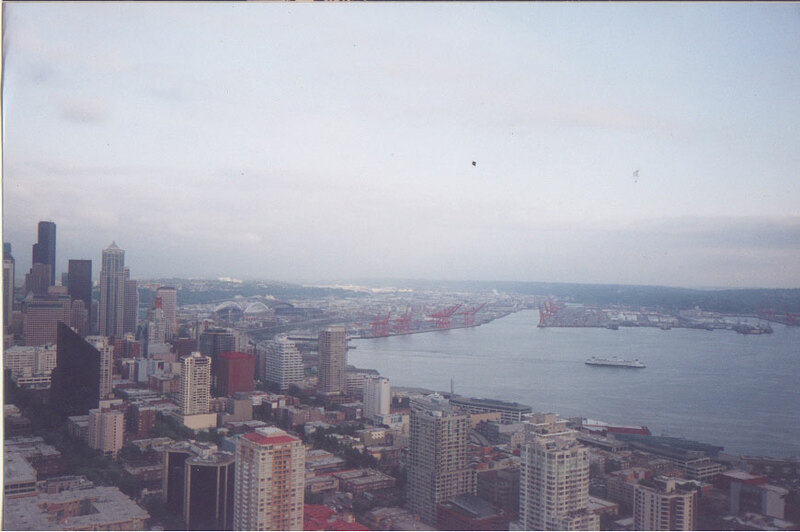 For us, this was a trip to the top of the Space Needle and also into the Experience Music Project. Living in Cleveland, I’ve visited the Rock and Roll Hall of Fame a few times. EMP was pretty much the same deal. EMP had focused areas such as a guitar room, a Hendrix room, a Bob Dylan room, and a Beatles room that contained various paraphernalia that might be seen at your local Hard Rock Café. The most notable difference is that EMP has a room dedicated to jamming. Cheze and I did a brief jam—he on guitar and me on keys. You also have an option to pay $10 to get 8 minutes of recorded jams to take home on CD. It was a nice touch, but nothing to get too terribly excited about if you can record at home with your own instruments. That night, we scoped out Capitol Hill, which seemed to be less touristy than Pioneer Square. It was the Sunday night before Memorial Day, but we were kind of let down by the lack of un-canned live music in either area of town. It seemed clear that Bill Frisell was Seattle’s musical pick that weekend. It was at the hoity-toity Jazz Alley, though the place did have some good sight lines to clearly view Bill’s band (except when he turned his back on the crowd to play with the drummer). At any rate, Memorial Day had arrived, and so did the end of our trip. It was, for the most part, non-stop. There was little chance that adding a couple of days would have amounted to additional down-time that would have been needed to catch up. Instead, I had to wait until I returned to Cleveland, which had the same clear sunny skies as Whistler when I got back home. It was likely the very same weather pattern we’d seen one week previous in the Northwest and a nice little meteorological lesson to end the bonanza of a trip I’d just completed.